I've been away from here for a while, and quite busy with (unfortunately) non-A&A-related things. But the Pontoise History Market is nearing, and so it is more than time to have a few things ready by then. Therefore here's this Stiletto (ca. 1650). 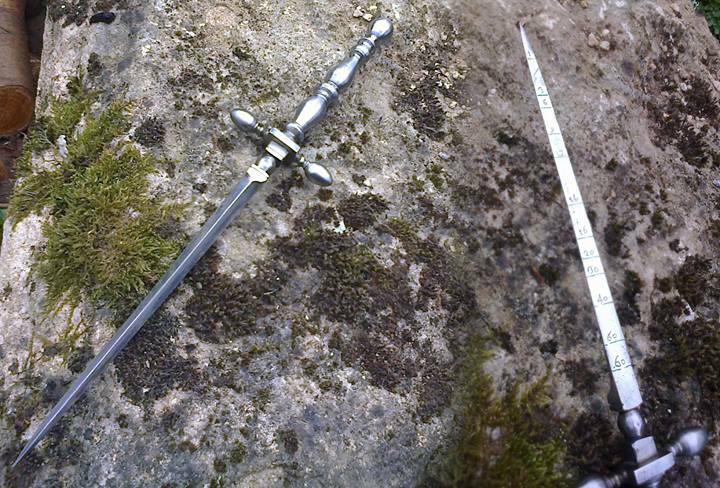 High-Carbon steel blade of strong triangular section, with square fileworked ricasso ; all-steel construction, with the cross-guard and handle entirely hand-filed to shape out of Steel. Strongly inspired by model A858 of the Wallace collection, with a few variations. The reverse of the blade sports etched marks corresponding to the bore/caliber/data needed by gunners - I placed them at the exact same spot (regarding blade width) than on the Wallace original, hence the lack of larger numbers as this blade is slightly thinner than A858 ; also, the original has two etched figures, a man and a woman, etched at the base of each flat of the blade, that I did not reproduce. It shall, in time, recieve a scabbard - and I'll post pics here when it's ready. OAL 301 mm, with a 183 mm blade. Modern makers never make stilettos for some reason, so well done for doing so and starting with a great piece. Very clean and crisp and wholly period believable. You hand filed the whole hilt ?! But it' so symetrical ! Looks like it was turned on a lathe. Did you use a rotation device to keep the tapers even and everything circular as you filed ? And then, only then did I use some form of rotary device for the sanding. But I don't have a lathe. Wow - all done by hand. Pretty impressive!